Trace and write the letters on the primary-ruled paper. 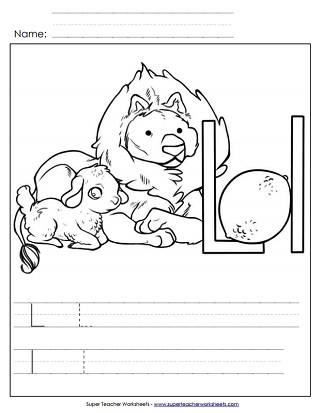 Then color in the pictures of the lion, lamb, and lemon. Trace the lowercase and capital letters on the band. Color in the illustrations of the ladybug, lion, and log. Cut, color, glue, and wear! Trace along the dotted lines to practice writing lower-case l on this worksheet. Draw your pencil along the gray lines to practice writing lower-case l.
Print this worksheet to practice writing upper-case L on the dotted lines. 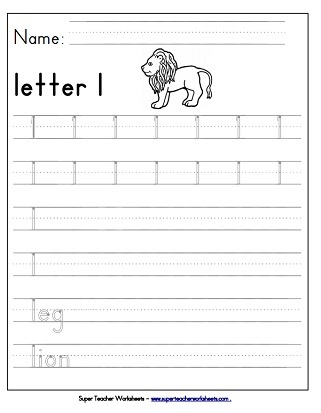 Here is another worksheet to practice writing upper-case L.
Learn all about the letter L in with this worksheet. Students can use bingo dabbers to dot the circles in the shape of letter L.